Use Fitch proofs to demonstrate that asymmetry is a consequence of transitivity and irreflexivity together. Use Fitch proofs to demonstrate that asymmetry is a consequence of transitivity and irreflexivity together . You are assuming symmetry and seem to be trying to derive a contradiction. Do not do that. 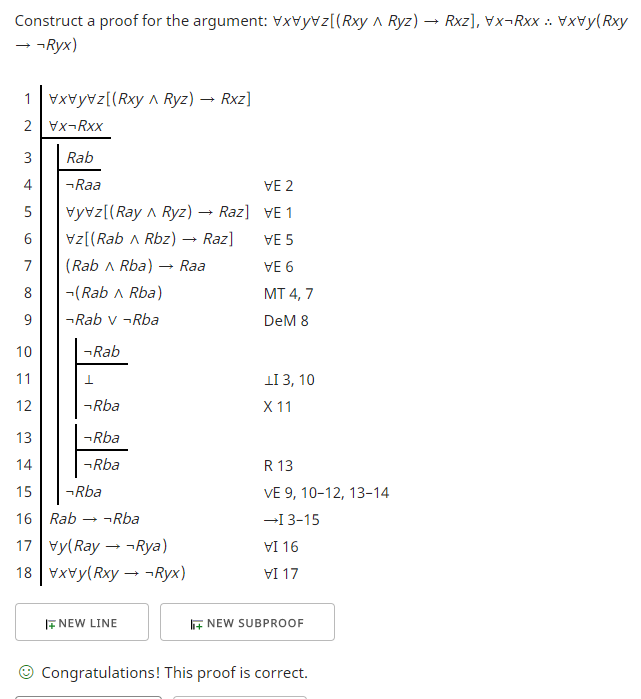 You are not trying to disprove symmetry: ¬∀x.∀y.(R(x,y)→R(y,x)). Your target is to prove asymmetry: ∀x.∀y.(R(x,y)→¬R(y,x)). That is not the same thing at all. Just assume Rab for any [a b], eliminate the universals so that transitivity and irreflexivity allow you to introduce a negation (specifically ¬Rba). I agree with Graham Kemp's answer. 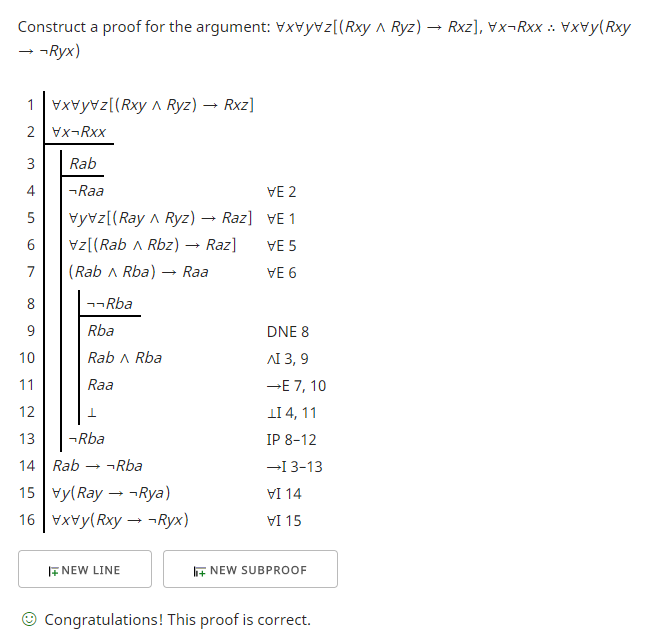 I am adding a proof using a Fitch-style natural deduction proof editor and checker. Just use the core rules of inference: assume Rba, to derive Rab ˄ Rba and thus Raa, which contradicts ¬Raa so therefore deducing ¬Rba. That checker explicitly lists ~E and ~I rules in the Basic Rules column. You can surely use them. The premises are in the first two lines. In lines 3 to 6 I use universal elimination (∀E) to replace the quantified variables, x, y and z, with the names, a and b. See Chapter 32, "Basic Rules for FOL" in forall x: Calgary Remix for a discussion. In particular I select names that will make the goal easy to reach: x becomes a, y becomes b, and z becomes also a. Since the goal is a conditional I will need to start a subproof with an assumption that is the antecedent of the conditional I want to derive. If I can derive the desired consequent then I can close the subproof discharging the assumption and introduce the desired conditional. This is done in line 7 to 13. 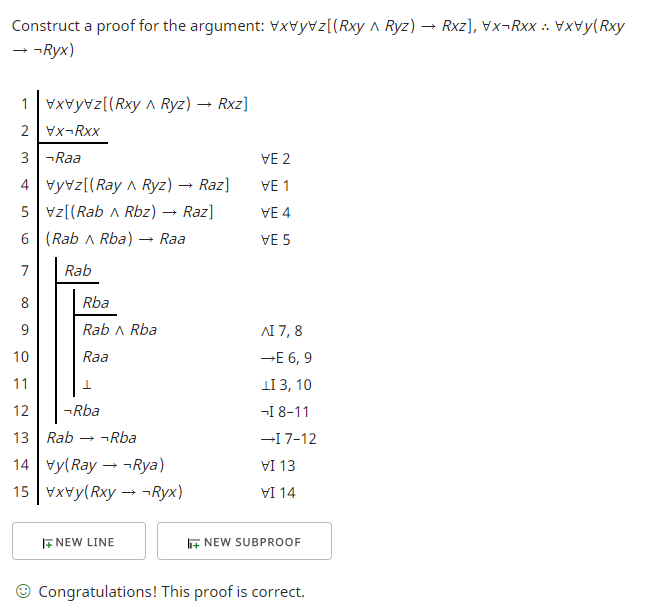 To complete the proof I use universal introduction (∀I) in lines 14 and 15 to reach the final goal completing the proof. How can I prove a contradiction follows from P <-> Q and P -> ~Q?